Randy Gentzler, vice president for finance and administration and treasurer at Loyola University Maryland, Baltimore, becomes the 2016–17 chair of the NACUBO Board of Directors on August 1. He succeeds Gregg Goldman, senior vice president for business affairs and chief financial officer at the University of Arizona, Tucson. In his role at Loyola, a Jesuit Catholic university, Gentzler serves as chief financial and business officer and is a key member of the president’s senior leadership team. He works closely with the trustees for the finance, investment, and audit committees. Beyond his work with the university president, Gentzler provides leadership, management, and strategic planning for 255 employees across the departments of finance and accounting, technology services, facilities and operations, dining services, human resources, the campus store, mail room, duplicating services, and emergency management. Prior to joining Loyola, Gentzler spent almost 20 years at Philadelphia University. First, from 1992–95, he was the assistant vice president for business and finance; then, from 1995–2011, he served as vice president for business and finance and treasurer. 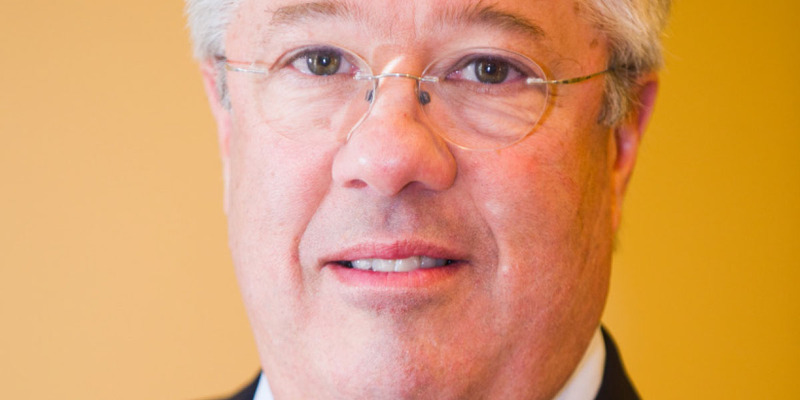 He also held several other financial and accounting positions in the health-care, government, and higher education sectors throughout Pennsylvania. Gentzler earned his master’s degree in business administration from Philadelphia University; and a bachelor’s degree in accounting from Elizabethtown College, Elizabethtown, Penn. He also completed Harvard University’s Institute for Education Management program, which is a total immersion experience that provides the opportunity to assess leadership skills and to develop tangible strategies for long-term institutional success. Gentzler has served on the NACUBO board since 2012 and was the EACUBO board president from 2014–15. He also served from 2003–11 on the member services committee for the Association of Independent Colleges and Universities, in Pennsylvania. The NACUBO vice chair for 2016–17 is Mary Lou Merkt, vice president for finance and administration, Furman University, Greenville, S.C. Lynn Valenter, vice chancellor, finance and operations, at Washington State University, Vancouver, Washington, will serve as secretary. Billing administration for student accounts. Types of federal student loans and their requirements. Types of private student loans. 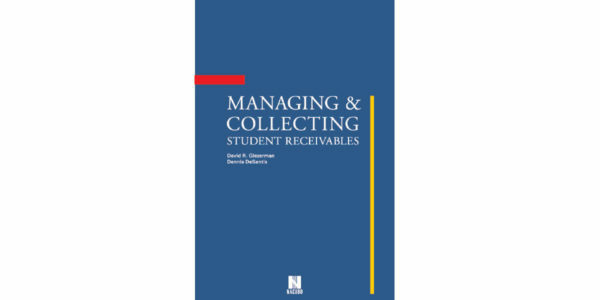 Ways to collect educational debt, including litigation and bankruptcy. Guidance for compliance with federal regulations. Case studies, sample forms and documents, a glossary, and a helpful list of key resources make this guide a complete compendium that you’ll reference again and again. Visit the Product Center on the NACUBO website to purchase your copy. 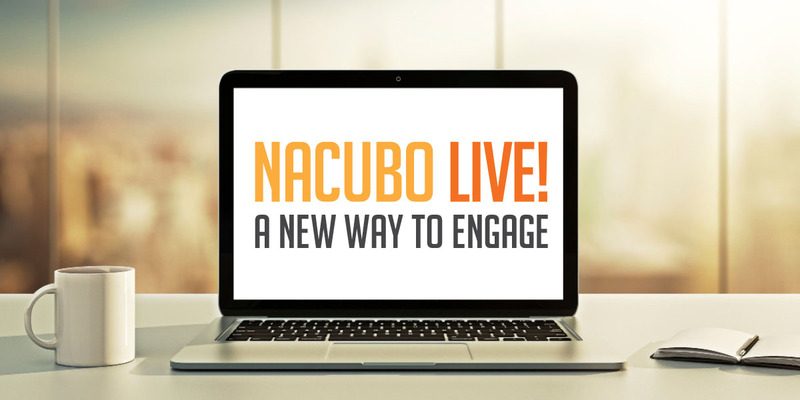 Register for the NACUBO Live! Annual Meeting and watch real-time video broadcasts of select sessions from Montréal. As a participant of the live broadcast, you can download resources, share information, and earn credits through the platform. Six sessions will be live streamed, with two bonus recordings. Each registration includes access to all live broadcasts, on-demand recordings, materials, chat rooms, and the ability to earn credits. Cost and Revenue Modeling: Moving Beyond Spreadsheets to Support Strategic Resource Alignment. Sparky and Thunderbird Take Flight. Ushering in a New Era of Leadership. Ensuring Student Success Through the Business Office. Understanding the Cloud: Best Practices for Education Business and Financial Officers. Two additional sessions will be recorded and available after the conference concludes. 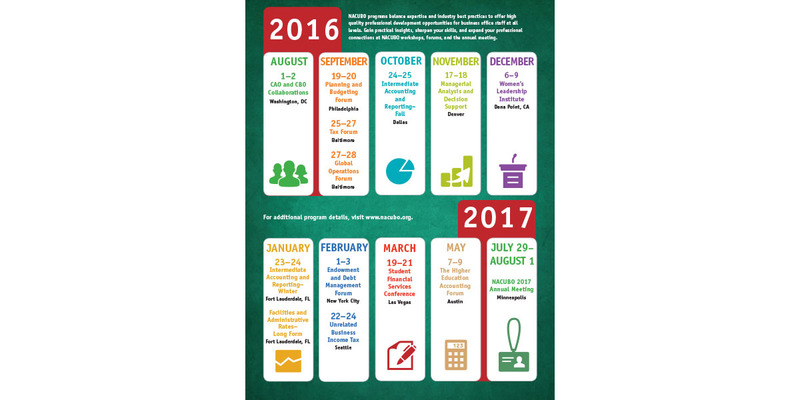 Fair Labor Standards Act Changes—Are You Prepared? 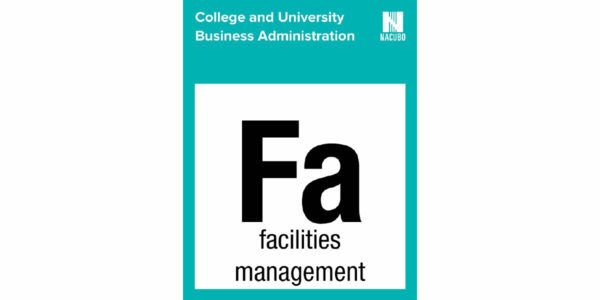 NACUBO is offering complimentary access to the new online facilities management chapter of College and University Business Administration. This chapter addresses how managing an institution’s physical assets involves a vast array of responsibilities, ranging from planning to construction administration to ongoing maintenance and sustainability. Learn more by visiting the “Online Publications” page on the NACUBO website. Consider entering your campus data for the 2015–16 cycle. The survey, which will open in August and will close the first week of December, consists of five relatively simple questions that can be answered by reviewing vendor or utility bills. For more information, contact Sally Grans-Korsh at 202.861.2571.